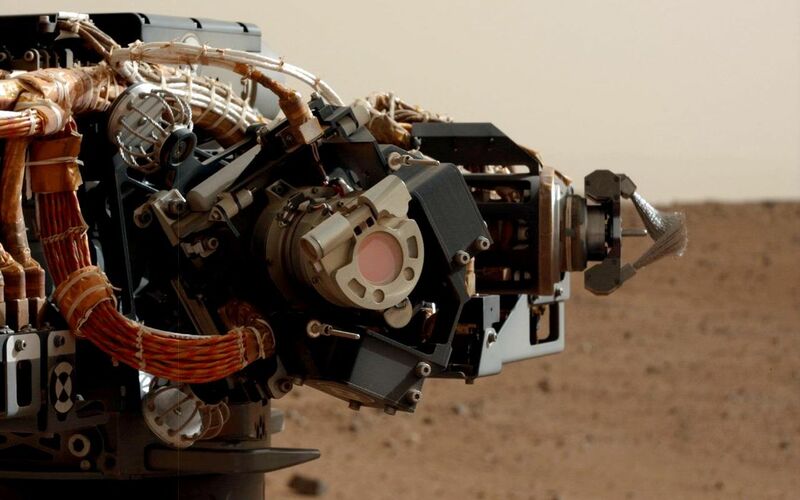 The left eye of the Mast Camera (Mastcam) on NASA's Mars rover Curiosity took this image of the camera on the rover's arm, the Mars Hand Lens Imager (MAHLI), during the 30th Martian day, or sol, of the rover's mission on Mars (Sept. 5, 2012). 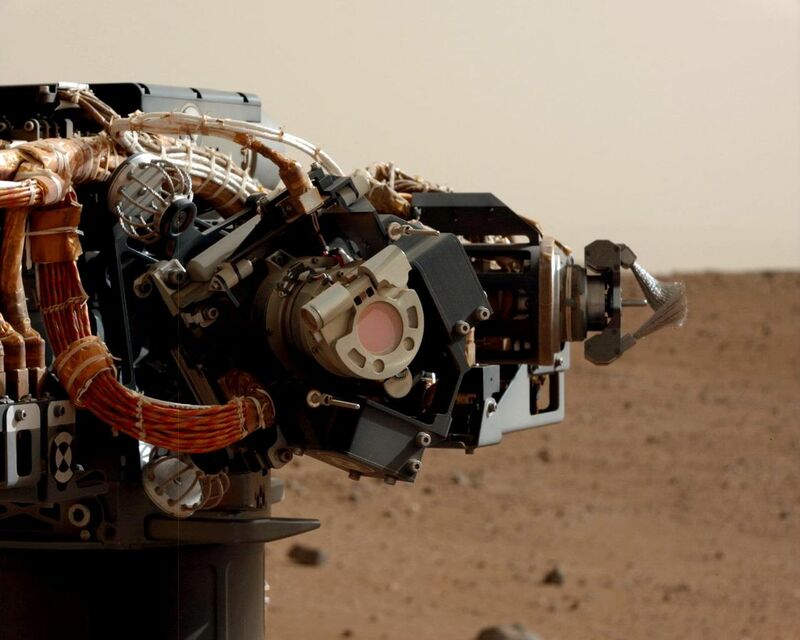 MAHLI is one of the tools on a turret at the end of the rover's robotic arm. When this image was taken, the arm had raised the turret to about the same height as the camera on the mast. The Mastcam's left eye has a 34-millimeter focal length lens. The image shows that MAHLI has a thin film or coating of Martian dust on it. This dust accumulated during Curiosity's final descent to the Martian surface, as the Mars Science Laboratory spacecraft's descent stage (or sky crane) engines were disrupting the surface nearby. 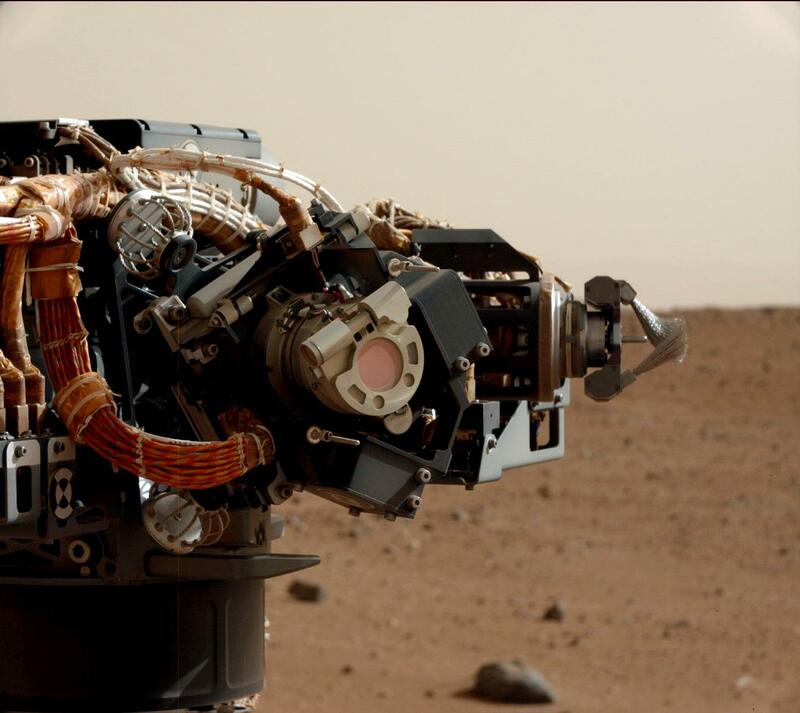 Effects of the dust were seen in the first image taken of Mars by MAHLI, on the day after landing (PIA15691). The MAHLI lens is protected from dust accumulation by a transparent dust cover. If the dust cover were clean, the images would appear as clear as if the cover were open. The reddish circle near the center of the Mastcam Sol 30 image is the window of MAHLI's dust cover, with a diameter a little less than a soda can's diameter. Inside the lens, each of the nine glass lens elements and the front sapphire window are bonded or cemented in place by a red-colored silicone RTV (room temperature vulcanizing) material. This is a space-qualified "glue" that holds the lens elements in place. When the MAHLI is viewed from certain angles, this material gives one the impression that the inside of the lens is red. The mechanism at the right in this image is Curiosity's dust removal tool, a motorized wire brush.